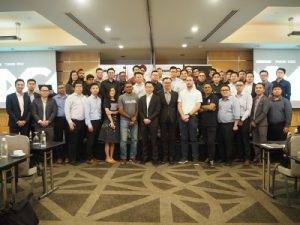 Shure recently hosted its “Meetings On The Move” launch event for the new Microflex Complete conferencing and discussion solution – supported by Singapore distributors Electronics & Engineering Pte Ltd (E&E), the event took place in Singapore’s Pan Pacific Hotel. 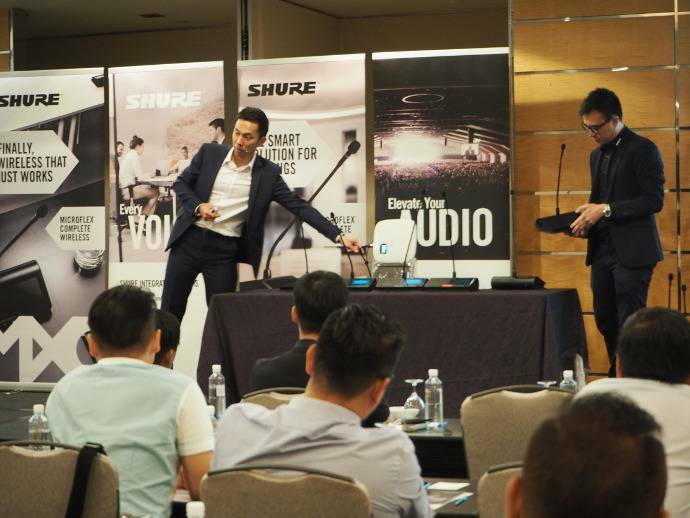 Stanley Chiu, Shure’s Senior Product Manager, shared several challenges that most conference users faced, namely effective management of large number of participants, sound reinforcement in acoustically challenging rooms, support for interpretation, as well as other meeting management capabilities that regular sound systems are unable to provide. Available in both wired and wireless configurations, Microflex Complete is an integrated audio system that empowers more productive conversations and decision making in conferences and meetings. Ideal for corporate, government, and education facilities, it combines microphone, loudspeaker, interpretation audio, and controls in one system and puts a compact but complete sound solution close to the user. The Microflex Complete wired system (MXC) supports meeting efficiency with a wide range of contemporary-styled portable flush-mount, and modular conference units that can be easily integrated into any room design, and has expandability to handle up to 3,800 participants and 31 interpretation channels. Add-on SW6000 Meeting Management Software makes MXC suitable for formal meetings and agenda-driven debates that require advanced capabilities such as agenda handling and electronic voting. Microflex Complete Wireless (MXCW) combines a fully-featured discussion system with wireless flexibility, speeding up setup in dynamic meeting spaces or at temporary meetings in hotels and conference centres. The system operates in the globally license-free 2.4 and 5 GHz spectrum and can be set up within just a few minutes. Thanks to Shure’s industry-leading Automatic Frequency Coordination and Interference Detection And Avoidance technology, MXCW performs reliably even in the most hostile RF environments. Smart lithium-ion rechargeable batteries allow up to 11 hours of use and robust AES-128 audio encryption ensure confidentiality in closed-door meetings. Previous articleCGR Cinemas Declares Future of Cinema is RGB Laser..